The Mobile Pizzeria is on the go! Ask us how to book for your special occasion. Designed for catering, special events, and random acts of kindness — we are happy to bring a little slice of local to every hometown. Want to know where we'll be next? Check out the calendar below. 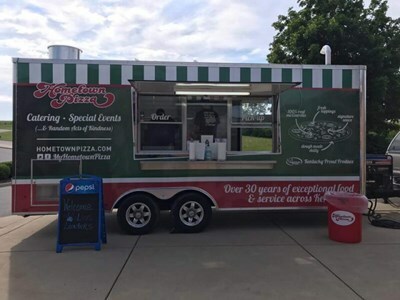 For more information, or to book the Mobile Pizzeria, please contact catering@hometownpizza.com or call us at 502-817-4437.